Strength training is an essential component of fitness for all equestrians. Whether competing in dressage, jumping, cross country, reining, or perhaps even racing, a strong musculoskeletal system is crucial for enhancing performance. Riding requires physically demanding skills involving a strong musculature, in both the upper and lower body. Strength training provides muscular strength, hypertrophy and endurance, as well as, neuromuscular improvements such as quickened reaction time, enhanced agility, speed, power, flexibility and fluidity of movement. Riders who engage in a comprehensive, and consistent, strength training routine will quickly see improvements in their balance, seat, and coordination. Strong muscles result in better control over the horse, both from the ground, and in the saddle, and communication through seat, leg and hand aids will also be enhanced. Well-developed core muscles will result in elegance in the saddle, proper posture, and are essential in maintaining rhythm, relaxation and suppleness in both horse and rider. Medically speaking, strength training helps decrease blood pressure, prevents osteoporosis, increases metabolic rates, and also fights heart disease, diabetes, back pain and arthritis. Weight training lowers the risk of injury to ligaments and tendons, as well as, strengthens bone. Remember riding utilizes every muscle in the body. Therefore it is imperative to strength train regularly, to develop a solid musculature. Strength training works in conjunction with both cardiovascular and flexibility training, the other two vital components of fitness. Strength training is the process of exercising with progressively heavier resistance for the purpose of strengthening the muscular system. Resistance training, a form of strength training, consists of using free weights, weight machines or resistance bands to overload skeletal muscle (either by pushing, lifting or stretching). The stress of lifting weights causes our muscles to adapt, and strengthen. Muscles are highly responsive to resistance training and develop quickly. Participating in a consistent weight-training program will increase muscle fibers in both size and strength resulting in muscular endurance. Resistance training increases contractile strength, bone mass, and reinforces tendons and ligaments. It also has the ability to change one’s body composition. Replacing fat with muscle may not change the number on the scale, because muscle weighs more than fat, but it will create a leaner, thinner appearance. For example, muscular shoulders create the illusion of a smaller waist. Studies demonstrate that after two months of weight training unfit men and women gained 2-4 pounds of muscle, as well as 40-60% more strength. Studies also show that without regular weight training we lose more than half a pound of muscle every year after age twenty-five. Interestingly, adding more skeletal muscle also raises one’s metabolic rate. Muscle, is very active tissue, demanding high energy/calorie needs. Muscles actually use up to 25% of our total calorie use while sleeping! Therefore, muscular people burn more calories while resting. Studies demonstrate that our metabolic rate drops by 5% every 10 years, leading to an increase in fat, due to the fact unused energy is stored as fat. So it makes sense to weight-lift regularly! When starting a weight training program it is always advisable to seek professional guidance. Certified personal fitness trainers are educated, and skilled in teaching proper weight training techniques. Your local fitness center is a good place to start searching for a certified trainer. You can also check out the American Council on Exercise (ACE) website (www.acefitness.org) or the American College of Sports Medicine (ACSM) website (www.acsm.org), both reputable organizations. If you are new to resistance training start with weight machines, if possible. These machines are designed to prevent moving past each muscle’s range of motion, thus avoiding injury. If access to weight lifting machines is not possible, then free weights (barbells, dumbbells) or exercise bands are a good alternative for those new to resistance training. Free weights offer interesting, and varied workouts, but without proper instruction, one runs the risk of injury and/or ineffectual lifting resulting in poor outcomes. Proper form, while lifting, is crucial for safety purposes, and good results. Each lift is specific to a certain muscle group. When lifts are performed incorrectly targeted muscles may not develop quickly, if at all. With proper form, beginners can expect to see muscular changes, in strength, and tone, with two or three 20-30 minute workouts per week. No matter which type of resistance tool you choose seek out professional assistance for safety and effectiveness. Decide what your goals are before starting any program. Are you training for performance enhancements? Functional strength? Toning/definition? Once goals are set, training can be tailored to achieve your objective. For toning and definition, for example, light weights/many repetitions are required, whereas training for larger muscles (size/mass) heavier weights are lifted for fewer repetitions. Remember that muscles adapt quickly growing in size and strength, by lifting progressively heavier weights. Lastly, muscles need time to recover from resistance training. Depending on the intensity of your workout allow your muscles about 48 hours of rest. The harder the workout, the longer rest period is required. Muscle fibers grow, and strengthen during this period of time. Recovery also helps to prevent overtraining, as well as, averts plateaus in muscular development. Resistance training lowers the risk of overuse injuries, and other degenerative ailments, such as arthritis. Eighty percent of low back pain, for example, stems from weak back and abdominal musculature. Strengthening both our back muscles, and opposing abdominal muscles will help stabilize our bodies while riding. Obviously, equestrians, of all ages, will find a myriad of benefits from strength training. Whether engaging in barn chores, such as pushing wheelbarrows, carrying bales of hay, or mucking out stalls, powerful muscles are a plus! 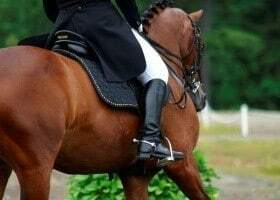 They also facilitate mounting from the ground, achieving elegance in the saddle, or enhancing imperceptible leg/hand aids. It is easy to see why building a powerful physique is key to achieving, and improving your riding performance. 1. Select at least one resistance exercise for each major muscle group to ensure comprehensive muscle development and proceed from larger to smaller muscle groups. Why? Exercises for large muscle groups require the smaller muscles to assist, therefore by the time you work the smaller muscle groups they are already fatigued so you don’t need to work them so hard. Workouts can be divided into upper and lower body. Every other day, for example, you can perform either upper or lower body exercises, or you can work your entire body on alternating days. Find a routine that works, for the first couple of months, and stick with it until it’s time to progress to a heavier weight. 2. Beginners are advised to choose a weight that they can lift no less than 8x in perfect form for the chosen exercise. Complete 3 sets of 8-12 repetitions (upper body), 15-20 repetitions (lower body) or until muscles are fatigued (incorporate a variety of resistance exercises, including one exercise for all major muscle groups). If you lose your form STOP! Lifting in less than perfect form not only puts you at risk for injury but it is a waste of time. Each lift is specific to a muscle group. When we lose our form we no longer target the muscles we are pinpointing. It is preferable to focus on repetitions completed in good form, rather than trying to finish a set of 12 in poor form. The weight is too heavy when your body starts swaying, or you need momentum to achieve the lift. When 12 repetitions can be completed increase the resistance by 5% (Do Not Increase By More Than 10% between sessions). In the beginning, you may only be able to successfully complete a small number of repetitions in proper form. That’s ok! When you can perform an upper body exercise for 8-12 reps, in perfect form, it is time to increase the resistance for that particular exercise. As your muscles strengthen the exercises will become easier and less challenging. 4. Remember to always breathe while lifting. Do not hold your breath! Exhale on exertion. No straining. Never squeeze the weights. Always have someone spot you when lifting heavy weights! Stop immediately if you feel pain or discomfort. Lifting weights can cause some muscular discomfort but never pain! 5. F.I.T. (Frequency, Intensity and Time) – (F) resistance train 2-3x week, (I) until fatigue, and (T) until all major muscle groups are worked. 6. No excuse! If you are short on time choose the push-up (a body weight exercise) to work your upper body and the squat to work your lower body. These two multi-joint exercises work all the major muscle groups. Push-ups can be performed standing against a wall (for beginners), on your knees, or with legs extended. Perform three sets of push-ups in perfect form, until fatigued and three sets of 15-20 squats in perfect form. 7. Remember it does not matter how much you lift, it’s HOW you lift!!! 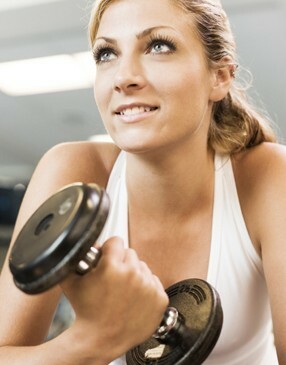 The idea is to exhaust your muscles until, for example, a five pound weight feels like 20 pounds!! That is your goal! 8. Lifting techniques – always stand feet shoulder width apart, bent knees, straight wrists, chin up, shoulders back and down. Upper Body – always work chest, back and shoulders first because they are the largest muscle groups of the upper body. You can do them in any order that you wish. Remember to perform 3 sets of 8-12 repetitions. Below are examples of upper body resistance training exercises. Lower Body – always work quadriceps, hamstrings, hips, glutes, then calves. Need to do more repetitions for lower body because they are the largest muscles in the body. Remember to perform 3 sets of 15-20 repetitions. Abdominals (see previous article) – the only muscle group that can be worked everyday for 10 minutes. 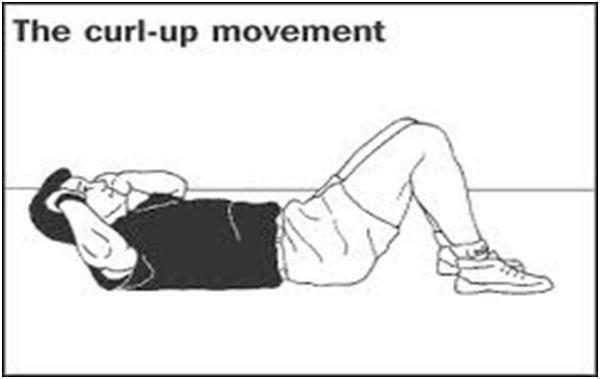 Comprehensive workout consists of regular curl ups, oblique curls and reverse curls. Not all exercises are suitable for everyone and this or any other exercise program may result in injury. Any use of this exercise program assumes the risk of injury resulting from performing the exercise and using the equipment suggested. To reduce the risk of injury in your case, CONSULT YOUR DOCTOR BEFORE BEGINNING THIS EXERCISE PROGRAM. The advice and instruction presented are in no way intended as a substitute for medical counseling. 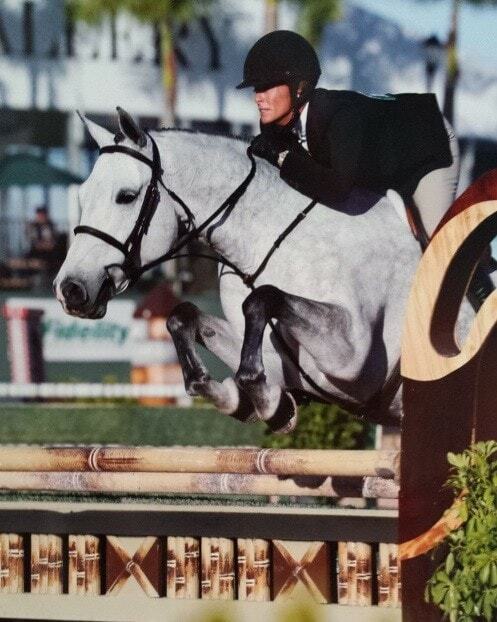 Robin J. Levine and Horse Authority disclaim any liabilities or loss in connection with the exercise and advice herein.